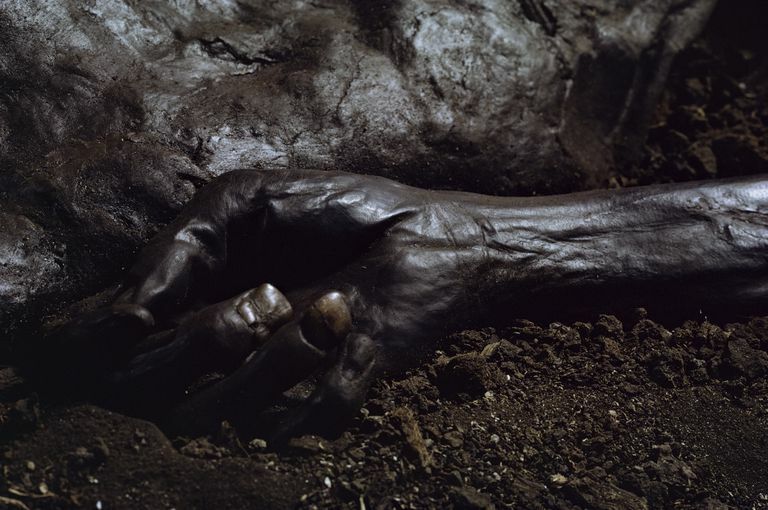 The Grauballe Man is the name of an extremely well-preserved Iron Age bog body, the 2200-year-old body of a man pulled from a peat bog in central Jutland, Denmark in 1952. The body was found at depths of more than one meter (3.5 feet) of peat. Grauballe Man was determined to have been about 30 years old when he died. Physical inspection indicated that although his body was in near-perfect preservation, he had been brutally murdered or sacrificed. His throat had been cut from behind so deeply that it nearly beheaded him. His skull was bludgeoned and his leg was broken. Grauballe man's body was among the earliest of objects dated by the newly invented radiocarbon dating method. After his discovery was announced, his body displayed in public and several photographs of him published in newspapers, a woman came forward and claimed that she recognized him as a peat worker she had known as a child who had disappeared on his way home from a local pub. Hair samples from the man returned conventional c14 dates between 2240-2245 RCYBP. Recent AMS radiocarbon dates (2008) returned calibrated ranges between 400-200 cal BC. Initially, Grauballe man was investigated by Danish archaeologist Peter V. Glob at the National Museum of Denmark at Copenhagen. Bog bodies had been found in Denmark beginning in the first half of the 19th century. The most striking characteristic of bog bodies is their preservation, which can be close to or surpass the best of ancient mummification practices. Scientists and museum directors tried all sorts of techniques to maintain that preservation, beginning with air or oven drying. Glob had the Grauballe man's body treated to a process similar to tanning animal hides. The body was kept for 18 months in a mixture of 1/3 fresh oak, 2/3 oak bark plus a .2% of Toxinol as a disinfectant. Over that period, the concentration of Toxinol was increased and monitored. After the 18 months, the body was immersed in a bath of 10% Turkish-red oil in distilled water to avoid shrinkage. New bog body discoveries in the 21st century are kept in wet peat in refrigerated storage at 4 degrees celsius. Grauballe Man's stomach was removed at some point during the process, but magnetic resonance imaging (MRI) investigations in 2008 discovered plant grains in the vicinity of where his stomach had been. Those grains are now interpreted as remnants of what likely was his last meal. The grains indicate that Grauballe man ate a type of gruel made from a combination of cereals and weeds, including rye (Secale cereale), knotweed (Polygonum lapathifolium), corn spurrey (Spergula arvensis), flax (Linum usitatissimum) and gold of pleasure (Camelina sativa). The Irish Nobel Prize-winning poet Seamus Heaney often wrote poems for and about bog bodies. The one he wrote in 1999 for Grauballe Man is quite evocative and one of my favorites. "As if he had been poured / in tar, he lies / on a pillow of turf / and seems to weep". Be sure to read it yourself for free at the Poetry Foundation. The display of bog bodies has ethical issues discussed in many places in the scientific literature: Gail Hitchens' article "The Modern Afterlife of the Bog People" published in the student archaeology journal The Posthole addresses some of these and discusses Heaney and other modern day artistic uses of bog bodies, specifically but not limited to Grauballe. Today Grauballe man's body is kept in a room at the Moesgaard Museum protected from light and temperature changes. A separate room lays out the details of his history and provides numerous CT-scanned images of his body parts; but Danish archaeologist Nina Nordström reports that the separate room keeping his body seems to her a calm and contemplative reburial. This glossary entry is a part of the About.com Guide to Bog Bodies and part of the Dictionary of Archaeology. Granite G. 2016. Understanding the death and burial of northern European bog bodies. In: Murray CA, editor. Diversity of Sacrifice: Form and Function of Sacrificial Practices in the Ancient World and Beyond. Albany: State University of New York Press. p 211-222. Hitchens G. 2009. The Modern Afterlife of the Bog People. The Post Hole 7:28-30. Karg S. 2012. Oil-rich seeds from prehistoric contexts in southern Scandinavia: Reflections on archaeobotanical records of flax, hemp, gold of pleasure, and corn spurrey. Acta Paleobotanica 52(1):17-24. Lynnerup N. 2010. Medical Imaging of Mummies and Bog Bodies – A Mini-Review. Gerontology 56(5):441-448. Mannering U, Possnert G, Heinemeier J, and Gleba M. 2010. Dating Danish textiles and skins from bog finds by means of 14C AMS. Journal of Archaeological Science 37(2):261-268. Nordström N. 2016. The Immortals: Prehistoric individuals as ideological and therapeutic tools in our time. In: Williams H, and Giles M, editors. Archaeologists and the Dead: Mortuary Archaeology in Contemporary Society. Oxford: Oxford University Press. p 204-232. Stødkilde-Jørgensen H, Jacobsen NO, Warncke E, and Heinemeier J. 2008. The intestines of a more than 2000 years old peat-bog man: microscopy, magnetic resonance imaging and 14C-dating. Journal of Archaeological Science 35(3):530-534. Villa C, and Lynnerup N. 2012. Hounsfield Units ranges in CT-scans of bog bodies and mummies. Anthropologischer Anzeiger 69(2):127-145.